There’s been a ton of interest in our WDW47 Challenge lately (Every Disney Ride in a Single Operating Day). If you’re not familiar with it, you can read all about it here. Today we want to address and clarify all the questions we’ve been getting lately about how Pandora will be treated for purposes of the WDW47 Challenge. 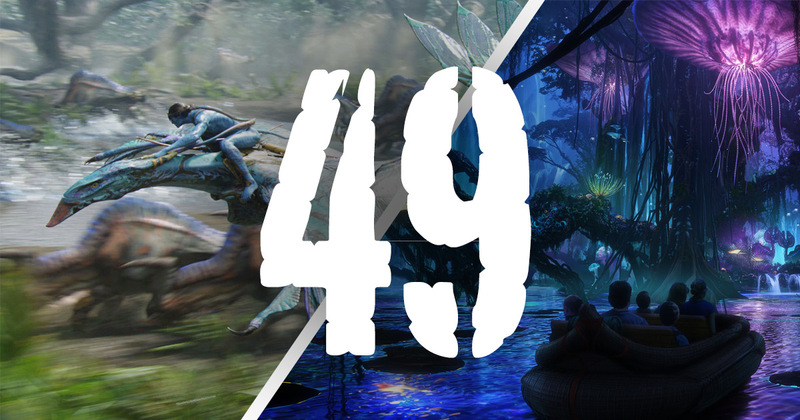 The two Pandora rides – Avatar Flight of Passage and Na’vi River Journey — should be seeing their first guests within a week. Animal Kingdom Cast Previews are set to begin next week, followed by other Cast Preview and Annual Passholder previews. Throughout the month of May, it’s also likely that the Pandora rides may soft open to regular day guests for a limited time. This may be as little as a couple hours, or sometimes even entire days. These soft openings are never advertised by Disney and are unpredictable. Because of the exclusive nature of preview dates and the unpredictability of soft openings, the Pandora rides will not count for the purposes of the WDW47 Challenge. If you happen to attempt the challenge on a day where the Pandora rides are operating but not yet officially open, you are not expected to ride these rides. Full credit for completing the challenge will be given for riding the other 47 rides at Walt Disney World. We have always been consistent that the only rides required for the challenge are those listed on Disney’s Official List of attractions. This official list currently shows the two Pandora rides as opening on May 27, 2017. At that time, the WDW47 Challenge will become the WDW49 Challenge. Beginning May 27, Challengers will be required to ride the two Pandora rides in addition to the other 47 Walt Disney World rides in order to receive credit for completing the challenge. This is consistent with how the challenge has evolved since its inception. It began life as WDW47. Then became WDW46 with the removal of Maelstrom and the Backlot Tour and the addition of Seven Dwarfs Mine Train. Then returned to WDW47 with the opening of Frozen Ever After last year. Parkeology considers all versions of the challenge to be equivalent. The goal has always remained the same: Ride every Walt Disney World ride in a single operating day. We correctly predicted that the 2 Pandora rides would be added to FastPass+, and that a tiered structure would be introduced to Animal Kingdom. Disney has since confirmed this. As has always been the case, the WDW49 version of the challenge allows the use of FastPass+ for Animal Kingdom, including the Pandora rides. Anticipating high demand, Disney has also announced Extra Magic evening hours throughout the summer for the Pandora portion of Animal Kingdom, available only to resort guests. The challenge has always allowed Extra Magic Hours, since they are available to a large portion of the guests at the park. This will continue to be the case with the Pandora Extra Magic Hours. Note that if Disney decides to implement a premium charge for the extra hours, this would fall into the “special event” category. Challengers are not eligible to use upcharge events for purposes of the challenge. This entry was posted in Theme Park Life and tagged Avatar, Flight of Passage, Na'vi River Journey, Pandora, wdw47, wdw49. Bookmark the permalink. Cast previews have already begun and AP previews are up next. I expect there will be some sort of regular guest soft opening around your timeframe. So I got to wondering what this is going to look like in a few years when I had a vision. The year was 2037 and you two were making one last go at the challenge (you know, because by that time, you’ll both be old). Tragedy struck early in the day when some punk kid thought it would be funny to steal the tennis balls off of Shane’s walker when he wasn’t looking making it much more difficult to scoot the walker across the ground. Shortly thereafter, Ted’s sciatica flares up and the attempt looks doomed. However, our heroes, having attempted the challenge 17 times previously, were well prepared for this scenario. You had a local company on standby who delivered two electric scooters within minutes, thus allowing you to no only continue the quest, but to possibly finish in record time. However, on the 2nd to last ride of the day as it was closing in on midnight, you both fell asleep on The Haunted Mansion and the cast members working the ride thought it would be funny to see how many times you’d ride before waking up. Alas, by the time you woke up, the park was closing and you had to leave. Bummer. We sadly would have to disqualify ourselves at the scooter delivery point: no outside help.